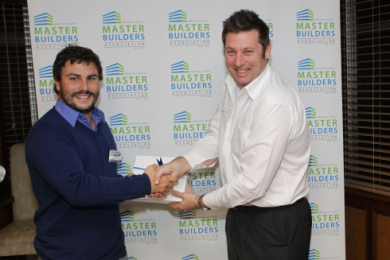 Master Builders KwaZulu-Natal earlier in the year sent out a membership survey form and requested that members return it completed. We wanted to ensure a decent response so we offered a prize of an Apple Ipad which certainly had the desired effect. The names of those who responded went into a draw and the winner was announced at our Annual General Meeting. The winner of the Ipad is Jess Rogers of Wilcote Franchising CC. Well done Jess and enjoy your prize! On a somewhat related note, if you have ever wondered (as I have), what it is about Apple products that make people hanker after them, perhaps Dilbert has the answer, CLICK HERE to find out.